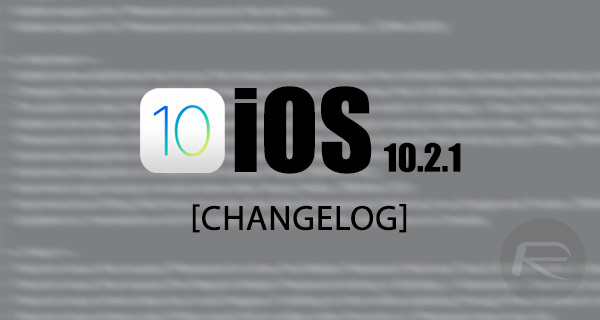 Here’s official iOS 10.2.1 release notes and changelog, showing granular information about all the changes, improvements, and additions that have made it into Apple’s latest firmware release, which is iOS 10.2.1, for iPhone, iPad and iPod touch devices. Nobody really expected iOS 10.2.1 beta process to begin so soon after iOS 10.2 dropped to the global public, let alone actually have the full and final release of it so soon. As we have come to expect with Apple and the company’s commitment to quality, iOS 10.2.1 has already been in the hands of registered developers and public software testers for over four weeks now prior to this release. That means we already had a chance to interact with and inspect iOS 10.2.1 to try and ascertain what’s exactly new before Apple actually made the firmware public for all today. Those initial pre-release seeds which were issued to developers and public testers have allowed us to actually come to the conclusion that iOS 10.2.1 is in fact a minor point-update that isn’t going to ignite a fire of enthusiasm amongst iPhone, iPad, and iPod touch owners. And today’s final release, and subsequent availability of the official release notes as well as security content changes, has confirmed all that. For those with a compatible iPhone, iPad or iPod touch, iOS 10.2.1 firmware update is available to download as an over-the-air (OTA) update right now. It is also available as a full IPSW download for those who may want to restore or update their iOS device using iTunes. You can find more details in our initial iOS 10.2.1 post here: Download iOS 10.2.1 Final Version IPSW Links For iPhone And iPad. I’m happy because it appears to have fixed an issue where a non-Apple Bluetooth headset device would disconnect from my iPhone fairly often. Since the update, I’ve not seen a disconnect thereafter. Is the battery drain on Iphone 6 fixed? I’m still on 10.1. The most incredible thing is, I didn’t update yet and my iPhone 6s already have a battery improvement since yesterday. This morning I woke up to see I lost only 2% of my battery during the night. Now I’m afraid of updating, which is something I always do after anew release.